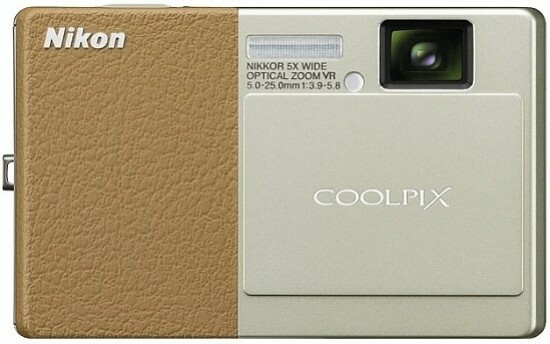 The Nikon Coolpix S70 is Nikon's first Coolpix camera to feature a large OLED screen and a 720p HD movie mode. This 12-megapixel touchscreen model is an evolutionary upgrade to the Coolpix S60 of yesterday, adding new-generation touchscreen functions such as multi-touch and gesture support. Other highlights, unchanged from the S60, include a 5x optical zoom lens and sensor-shift Vibration Reduction. The Nikon Coolpix S70 costs £339 / €379 / $399.95 and comes in a choice of colours and textures including Red & Red, Champagne & Beige, Black & Black, or Champagne & Light Brown. The Nikon Coolpix S70 is a very well built ultra-compact camera. The elegantly simple front plate features a sliding lens cover and a rubber coating that feels like soft leather to the touch. Like many other, similar cameras, the Nikon S70 is powered up by sliding the lens cover downward, a move that exposes the lens, flash and AF assist lamp; and readies the camera for action in less than two seconds. There is no dedicated on/off button - a sensible design solution, as it would be redundant anyway. What seems less sensible is that there is no physical Playback button either, meaning that you need to expose the lens even when you do not intend to take pictures, just review what you have already shot. In fact the only physical control other than the sliding cover is the shutter release button, found on the right-hand side of the top plate, exactly where you would expect it to be. Everything else, including zoom operation, is done by way of the touch-sensitive screen that occupies the entire rear panel of the camera. The lens is of the internally stacked variety, which does not extend upon power-up or zooming - this is one of the reasons why the Coolpix S70 takes less time to start up than most other compact cameras. Nikon has made an apparently deliberate effort to shift the lens away from the upper right-hand corner - when viewed front on - in order to reduce the possibility of it getting blocked by a finger. This attempt is only partially successful - your middle finger may still intrude into the lens’ field of view if you are not careful enough. The lens has a focal range of 5-25mm, which translates into a more than usable 28-140mm in 35mm equivalency. Aperture-wise it is not particularly fast; its brightness being f/3.9 at the wide end and f/5.8 at full telephoto. Like most small-sensor digicams, the Nikon Coolpix S70 lacks an iris diaphragm. In very strong daylight it employs a built-in neutral density filter to avoid overexposure, but this obviously has no effect on depth of field, as the physical size of the aperture does not change. The S70 has Nikon’s Vibration Reduction (VR) feature on board to prevent blurring from camera shake. Unlike the manufacturer’s SLR system, Vibration Reduction in the S70 is sensor-, rather than lens-based. It is automatically turned on by default, but you won’t notice anything unusual except you can take sharp photos at shutter speeds that are critically slow for the focal length used, as demonstrated in the Image Quality section of this review. As noted above, the user interface relies almost entirely on the 3.5” OLED touchscreen, which is one of the main selling points of this camera. We have all been repeatedly told that OLED (Organic LED) was the future, and it’s one of the reasons why the Nikon S70 has grabbed our interest. In practice, however, we did not find it to be noticeably different to the better LCD screens out there - outdoors visibility was quite good, but not outstanding; with the screen being still prone to glare in broad daylight if the sun-rays hit it at a certain angle. To be fair, some of the reflexiveness should be blamed on the fingerprints covering the screen, but then fingerprints are a fact of life with touchscreens. The colours of the screen were pleasantly vibrant, although it has to be noted that the white balance of the live preview often differed from that of the final image quite noticeably. The viewing angle was excellent, with no apparent loss of contrast or colour shifts when not viewing the display straight on; this is excellent news for those who like to shoot at waist level or from above the head. The screen's resolution of 288,000 dots is a little on the low side for a 3.5” display - 460,000 dots would have been nice - but it's adequate. Note that the screen's aspect ratio is 16:9, while that of the sensor is 4:3 - this means that your photos will not fill the screen unless you shoot at the 16:9 setting, at which image resolution is reduced to 8 megapixels. There are four main shooting modes on the Nikon Coolpix S70, including Easy Auto, Auto, Scene and Movie. Somewhat confusingly, Auto is the mode that gives you the most control over the shooting process. No, you don't get to set shutter speed or aperture directly - the latter would be impossible given the lack of a diaphragm anyway - but you can set the ISO speed manually, which is something you cannot do in the other modes. Functions and features accessible in this mode include the self-timer, flash mode, image quality setting, smile timer, exposure compensation, touch shooting, macro, drive mode, white balance, date imprint and zoom. All of these functions have clearly labelled virtual buttons, which you can operate at a touch of a finger. The zoom control implementation was not to our liking; a traditional zoom lever would have been a more straightforward solution. In practice, we have found the touchscreen controls to be too sensitive at times, and not sensitive enough at other times. This has resulted in some frustration with the camera, as we sometimes found ourselves in a menu we had not wished to enter, while at other times we had to push a “button” repeatedly until it did what we wanted it to do. While some of the features and functions listed above are self-explanatory, a couple of them need further clarification. The Touch Shooting “button” brings up a menu with three choices, Touch Shutter, Subject Tracking and Touch AF/AE. Touch Shutter means that touching the screen at any given point of the frame will result in the camera's focusing on that point and immediately snapping a picture upon achieving focus. This is quite a fast way of snapping a photo - while focusing speeds are not SLR class, the fact that you can pick a focus point by simply touching the desired part of the frame, and then not have to even touch the shutter release to initiate autofocus and image capture means that the entire picture taking process may actually take less time than with an SLR. On the flip side, enabling this function may cause you to take a few photos involuntarily. By contrast, Touch AF/AE is simply AF point selection by touch, which still requires you to press the shutter release to actually take a shot. This was the setting I ended up using most of the time. Finally, Subject Tracking lets you pick a subject by touch, and allows the camera to follow that subject if it moves within the frame. This feature works best when the selected subject is - or has - a human face. Smile Timer is similar to what Sony calls “smile shutter” - turning this feature on will get the camera to hunt for smiling faces and snap a photo whenever it detects one. Honestly, this is more of a party trick than an actually useful function, in our opinion. The Easy Auto mode is similar to Auto, but with less user control options provided. The Scene modes include Portrait, Landscape, Sports, Night portrait, Party/indoor, Beach/snow, Sunset, Dusk/dawn, Night landscape, Close-up, Food, Museum, Fireworks show, Copy and Backlight, plus there is a Panorama assist mode (without in-camera stitching) and a drawing mode, which allows you to draw pictures using your fingertips or a stylus. The S70 is the first Coolpix to feature a 720p HD video mode. The video features are basic: you can choose the autofocus mode (full time or single spot), switch the macro mode on or off, and set the movie quality (720p HD at 30 frames per second, VGA or QVGA at either 30 or 15fps). You cannot manually set white balance, gain or exposure compensation, neither is there an AE lock function. The optical zoom cannot be used while filming, but can be set to the desired position beforehand. During video capture, up to 2x digital zoom can be used. The clips are compressed using the Motion JPEG codec and stored in an AVI container. Irrespective of shooting mode selected, you will always find a Home button in the bottom right-hand corner, which will take you to the main menu if touched. Most of the menu items are redundant, as they are accessible from either record or playback mode, but this is also where you can access the Setup menu from (we wonder if instead of a Home icon we could just have a Setup button that would take the user directly to the Setup menu). This is where you can turn off Vibration Reduction when shooting from a tripod, set the date and time, mute or enable all electronic sounds, switch off the digital zoom function, format the memory card, and access a few less important or rarely used features. Going from record mode to playback is done by tapping the familiar and unmistakeable Playback icon. This is one of the slower operations on the Coolpix S70, which can be a bit annoying if you need to quickly delete a photo you have taken by accident, for example. Going back from playback to record mode is similarly sluggish. While the S70's gesture and multi-touch support - which set it apart from its predecessors - come into play in some of the shooting modes too, where exposure compensation, colour temperature or saturation can be set using a sweeping gesture, depending on the selected shooting mode), it is in playback where they can really be exploited. Going from one image to the next is done by way of a sweep of a finger, while you can zoom in and out of a photo by pinching. Apple iPhone users will be familiar with this, but it has to be noted that none of these effects is as immediate or fluid as on an iPhone 3GS, for example. The Nikon S70 has an orientation sensor, and can rotate the images based on how you are holding the camera. Unfortunately, this function does not work particularly well, with the camera often auto-rotating images back and forth even at the slightest movement of your hand, which can be quite annoying. Quite surprisingly, the camera does not display any meaningful exposure data along with the photo you are viewing; nor does it provide a histogram to judge exposure (there is no live histogram in record mode, either). On the other hand, there are quite a few post-capture image modification / retouching functions, including D-lighting, stretching, perspective control and monochrome options (black and white, sepia or cyanotype). You can also decorate your photos with hearts, stars and other shapes, insert a date stamp, downsize them for Web resolution or add a voice memo. The images may be stored in the S70's internal memory - which holds only four full-resolution photographs at the higher quality setting), or on an SD card. The card / battery compartment door is on the bottom plate, next to the USB port and the tripod socket. The power source is a proprietary EN-EL12 Li-ion battery, which can be charged via a computer using the supplied USB cable or via the EH-68P AC adapter, using the same cable. Although the battery is removable, it must be in the camera for charging (much like a cell phone battery). The number of images that can be captured on a single charge is about 200, though the actual figure may vary with the amount of flash and zoom usage. The camera comes with a software CD-ROM and a 180-page user's manual (usually printed, but this might depend on where you live). The PDF version of the manual, which is also available on Nikon's website, is reasonably well cross-referenced. This rounds off our evaluation of the features, handling and ease-of-use of the Nikon Coolpix S70 camera. Let us now move on to the Image Quality assessment!